THE INFORMATION YOU NEED TODAY! Epoxy flooring is one of the most easily maintained and long-lasting floors any healthcare building, business, home garage, basement, or patio could have. If you’re looking to remodel or if you’re in the market to save money then epoxy flooring system is for you. With easily customizable options you can turn your floor from ordinary to extraordinary. Epoxy Floors/Coating are incredibly safe and important for people who are seeking completely sealed floors that are hygienic, waterproof, and durable. Epoxy flooring is a controlled chemical surfacing agent that is converted from a liquid to a solid state, which makes these coatings strong and chemical resistant. During the conversion stage, epoxy coatings are extremely adhesive, allowing them to create a secure bond with new or old concrete surfaces. This process creates a seal to make epoxy floors strong, durable, and resistant to wear and tear. Our trained professional contractors know exactly how to install these floors quickly and efficiently. Prior to adding a coating to an old or new concrete floor we will make sure that any crack, adhesion, stain, or chemical damage is either fixed, patched, or removed, to ensure the successful installation of your new epoxy floor. WHERE CAN THESE FLOORS GO? 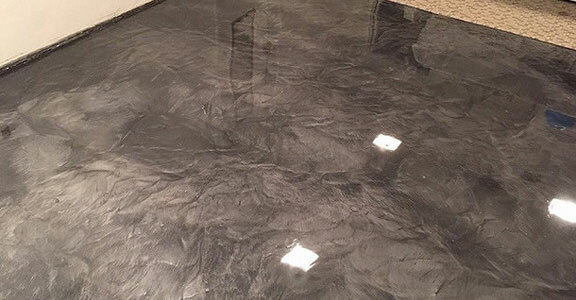 AN EPOXY CONCRETE FLOOR IS NOT ONLY MADE FOR INDUSTRIAL OR COMMERCIAL BUILDING, RATHER, YOU CAN HAVE A FLOOR LIKE THIS INSTALLED IN YOUR HOME TODAY! Whether it be your garage, basement, or any living space, give us a call and speak to one of our contractors today. flooring is a very popular choice for many businesses and homeowners who want a glossy finish, an easy to clean, low maintenance, and strong surface that offers long-lasting flooring that essentially will never need replacement. If you have a business with heavy foot/vehicle traffic or a garage that is always being occupied, a concrete garage floor is the right move. 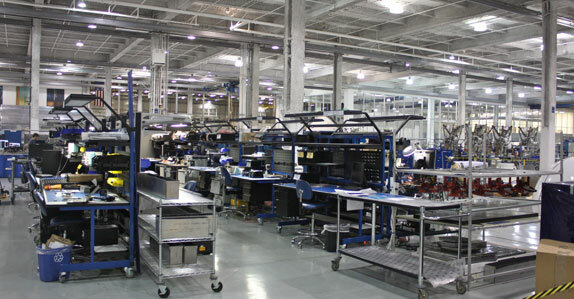 Our epoxy installers are prepared to work both quickly and efficiently. We know how precious your time and space are, so we provide diligent and professional results to complete your project in a timely manner. Flooring doesn’t have to be tricky. 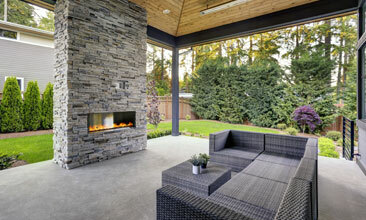 When redesigning, installing, or building a new home, having an attractive, practical, and usable space is important. If you need a new epoxy concrete flooring, whether because you’re ridding your space of damaged flooring, moldy wood panels, or tiles that no longer suffice for your space, we have the option for you. The fantastic quality of our products is simply put, practical and durable and does not have to detract from an attractive and uniquely designed floor. 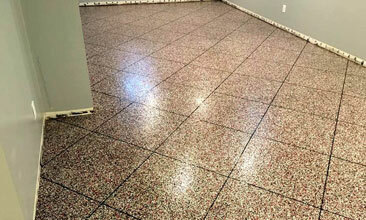 Harsh basement environments should be laid with epoxy flooring because they are meant to withstand the test. is an important attribute to any concrete floor. If you own, manage, or work in an industrial area, you know that a strong floor is one of the most important parts of everyday work. An epoxy floor can withstand daily wear and tear use, is stain and slip resistant, and will not absorb damaging chemicals/ minerals that erode most floors. In an industrial area, you need a floor that can be skid resistant, can stand up to the temperature cycles of the climate outside, and is difficult to crack, stain, or break. If your concrete wasn’t sealed when it was first cured, it’s not too late to do it now. Concrete cleaning and sealing is a cost-effective way to remove years of buildup from your exterior concrete and protect it against damage in the future. As one of the leading concrete sealing companies in Grand Rapids, we offer affordable concrete sealing to increase your concrete’s lifespan, reduce flaking and spalling, and protect against stains and mildew. Contact us to learn more about the benefits of sealed concrete and how it can give your home a much-needed boost in curb appeal. Wood stamped concrete is the ultimate combination of the durability of concrete and the natural beauty of wood flooring. Concrete floors that look like wood can give you a richly colored and textured basement or garage floor that won’t be damaged by water. Outdoors, wood concrete gives you the realistic look and feel of a wood pool deck or patio without the annoying upkeep, repairs, and short lifespan. Wood stamped concrete is a smart investment that can renovate existing worn-out concrete or give new concrete a permanent decorative look. A liquid rubber floor coating can instantly transform any concrete surface into a skid-resistant and waterproof workspace. 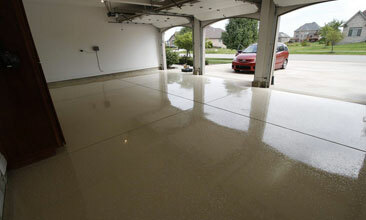 A rubberized floor coating creates a robust and permanent waterproof system that’s used in garages as well as commercial and industrial settings. 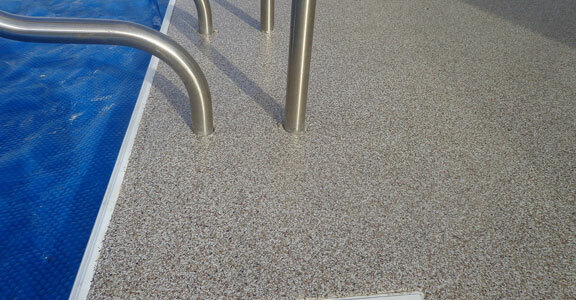 This type of floor system can be used indoors or outdoors and comes in a wide array of colors with textured options to give you a custom rubber floor coating to meet your needs. Whether it’s installed in a gym, food processing plant, garage, or auto shop, you can count on a rubberized floor coating in Grand Rapids for long-term performance. has become a new popular style for high traffic areas that can transform any boring space into an aesthetically inviting one. It can enhance your interior flooring space the way you want it to. Metallic epoxy flooring can be applied to an already existing concrete floor or can be designed to fit the individual vision you may have in mind. The application process of a metallic floor look is ultimately similar to the rest. Our contractors are fast and professional and will never take more time than is absolutely necessary to ensure a beautiful finish. Metallic epoxy is popular for lobbies, retail spaces, showrooms, and more. Because these floors are popular in spaces where diverse groups of crowds are on the go, extra layers of top coats are recommended to increase scuff resistance. The benefits these floors add range from aesthetic ones like seamlessness, décor coloring, and uniqueness, to more practical benefits, such as water resistance, durability, and quick installation. is cost-effective in more ways than one. For example, if you live in a diverse climate environment your floor takes the beating. If your flooring is in constant need of repairs and cleaning, you and your business are spending less time working on the important things. Less time spent growing your business means lower profits. Or simply, if you are constantly replacing your floors you are spending more money on an easy fix, commercial flooring. We employ skilled and highly trained contractors who will dedicate time and resources to perfect your commercial epoxy floor. These floors are versatile and are used in many different areas/fields, such as medical buildings, schools, and industrial buildings. With flawless looks and incredible longevity, other concrete looks frail, amateur, and ordinary.of time. You can have both. Quality and beauty do not have to be mutually exclusive with our professional epoxy flooring services. come in two different forms: acidic solution and acrylic stain. The acidic solution reacts with the lime in your concrete and is much more permanent because it is literally chemically reacting with your concrete. Whereas, an acrylic stain is comparable to the way paint adheres to the walls. An acrylic stain is paint for your concrete. However, unlike paint, this stain penetrates the concrete’s surface to bind with it through the concrete’s pores, which doesn’t allow much variation in tone. These two methods, compared to an epoxy finish, do not protect your floor as well or as long as an epoxy flooring surface, but they do allow for a unique look. will enhance safety, aesthetics, and durability. During the summers and warm weather, a pool deck is extremely important to the safety and attractiveness of your backyard. Keeping your pool deck in excellent condition is an important aspect even when months go by without using it. That is why, while we are remodeling or resurfacing your concrete pool deck, we will keep you fully informed, educate you on how best to care for your deck, and complete in the process quickly and efficiently. 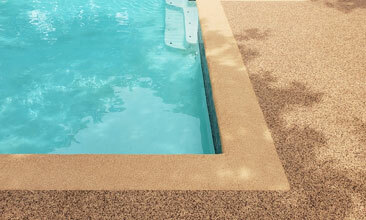 Resurfacing your pool deck will enhance safety, aesthetics, and durability. During the summers and warm weather, a pool deck is extremely important to the safety and attractiveness of your backyard. Keeping your pool deck in excellent condition is an important aspect even when months go by without using it. That is why, while we are remodeling or resurfacing your concrete pool deck, we will keep you fully informed, educate you on how best to care for your deck, and complete in the process quickly and efficiently. 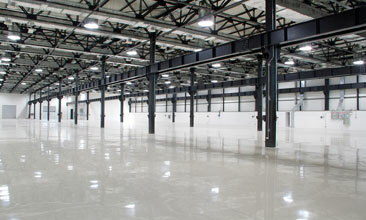 SOME OF THE BENEFITS OF AN EPOXY FLOORING SYSTEM? What makes an epoxy floor so desirable? These floors make any area look bright and professional. Their appearances, smooth surfaces, and low maintenance have grown in popularity for more than just industrial and commercial use. Epoxy floors are resistant to just about anything that can be brought in or spilled on top of them. They withstand chemical spills, temperature resistant, and unwarranted cleaners. You name it. these floors will resist it. Durability cannot be beaten. These floors have a longer lifespan than many other floor types. The variety an epoxy floor offers is also one of the most attractive details about the floor. If you have a vision for your floor then an epoxy floor can deliver. When installing a new flooring system you don’t want to be put out for too long and with an epoxy floor, you won’t. These floors are quickly and easily installed. The lower the maintenance on your floor the easier your day will be. Constantly worrying about the next time you need to treat, mop, or using cleaner on your floors can be exhausting but with epoxy flooring, you don’t have to worry about that. Because of the glossy coating that our epoxy floors have, our floors brighten up a room. FRIENDLY TEAM, AND THE BEST PRICE HANDS DOWN. Epoxy coatings are a green option! Meaning, they’re installed using less materials than other floors, making them a great alternative to other floors. 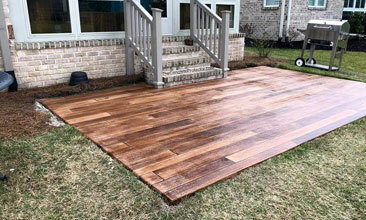 Our professional contractors deliver spectacular services at the lowest price. Are you located in Grand Rapids, MI? If so then you’ve found the company that excels in customer satisfaction. Our concrete contractors use the high-end materials and equipment to ensure quality work but, as a company, we know that high-end work doesn’t have to cost high-end prices. If you want affordable but amazing, here we are. With years of experience and commendable work ethic, we are here to serve you. Looking for a professionally installed Epoxy Flooring System?